You now can quickly switch with Ctrl+Alt+K between the German and the US layout. Quite efficient, especially since the keyboard layout config page allows to switch the language on application basis. Switching the keyboard layout has one potential issue, though: The shortcuts remain unchanged. So if undo is mapped to Ctrl+z in the German layout, it is still mapped to Ctrl+z in the US layout. Note that by ‘z’ we refer to the hardware key on the keyboard. As a consequence, in the US layout, hitting the hardware key ‘y’ on the German keyboard inserts the character ‘z’, but the z in Ctrl+z is still on the hardware key ‘z’. This behavior may or may not be wanted. 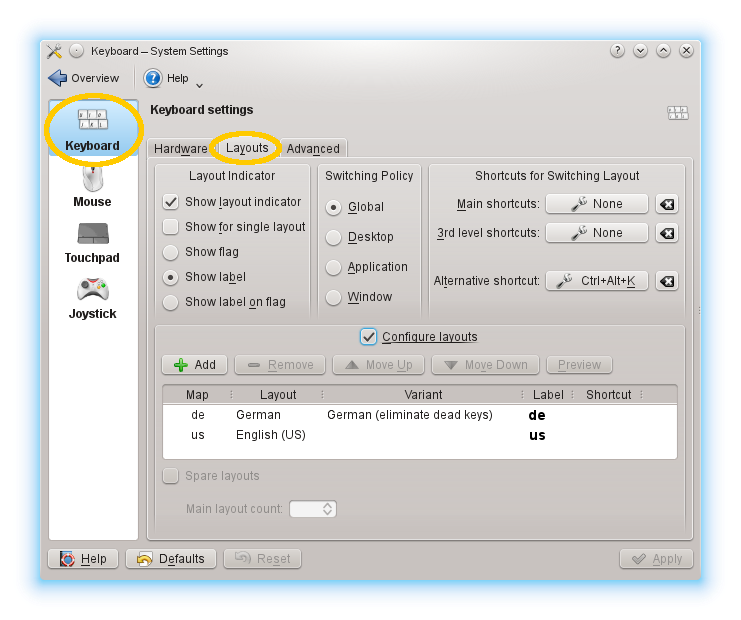 Getting more into detail reveals that the order of the keyboard layouts in the first screen shot is of importance: If you first add the German ‘de‘ layout, and then the English ‘us‘ layout, then the shortcuts will always use the Germany keyboard layout, independent of what keyboard layout is chosen. Reversely, if you first add the English ‘us’ layout, and then the German ‘de‘ layout, then the shortcuts will always use the English ‘us‘ keyboard layout. So it seems that the order defines a priority, and the shortcuts always use the first entry in the list. 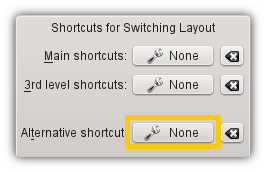 The correct solution to fix this would (in my humble opinion) be to add an option ‘[x] Shorcuts follow keyboard layout‘ or similar. But since this option does not exist, let’s do a quick hack to still get what we want here. Click apply and close the dialog. Now, the shortcut ‘Ctrl+Alt+K‘ is unbound. Our idea is now to create a script that toggles the keyboard layout by calling setxkbmap with the appropriate parameters and bind this script via a global shortcut to ‘Ctrl+Alt+K‘. Notice, that the keyboard layout indicator in the panel switched to ‘us‘. Calling the first variant with de,us again, we get back to the German layout. Each time we execute this script, the keyboard layout is toggled. As a comment for this new item, we write ‘Switch Keyboard Layout‘, in the ‘Trigger‘ tab, bind the global shortcut to ‘Ctrl+Alt+K‘, and in the ‘Action‘ tab, choose the switch-keyboard-layout.sh script. Finally click Apply, and close the dialog. 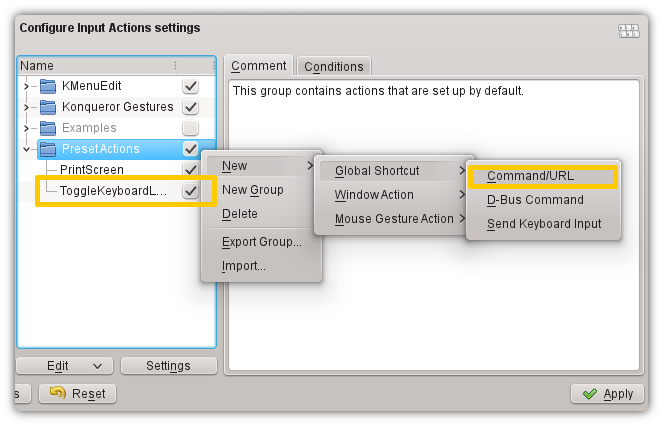 Now, hitting Ctrl+Alt+K calls our script and correctly toggles the keyboard layout including the shortcuts. Unfortunately, this approach does not support e.g. switching the keyboard layout on application basis as the switching policy of the Keyboard settings (first screen shot) allows. Still it works.